It’s been just over two weeks since Supper in the Suburbs went live and that I finally moved in with Jon. 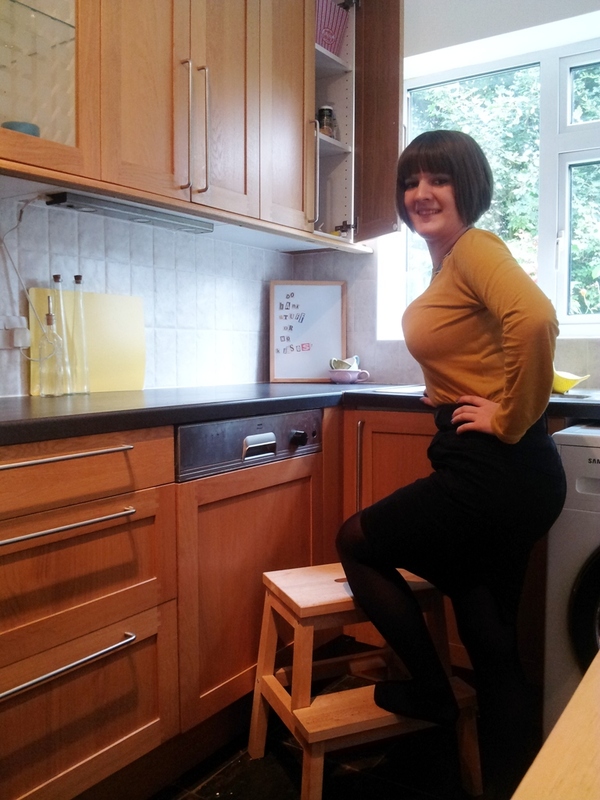 Now that I have a home of my own I really wanted to share more with my readers, and what better place to start than by sharing my favourite room in the flat – My Kitchen. It’s no secret that food bloggers (myself included) spend a lot of time in their kitchen so I thought it would be fun to give you a bit of a virtual tour, perhaps revealing a few things about myself in the process. I’ve also asked some of my fellow bloggers to share posts about their kitchens too and you can find the links to their posts at the end of this one. So without further adieu, I’d like to welcome you to My Kitchen! I guess the first thing you notice when you walk in is the window at the end. It might be small but during the day it lets in loads of light and its wonderful looking out on to our little patch of green on the edge of the city. You can even see birds nesting in the trees! It certainly makes doing the washing up that little bit easier. It’s also hard to miss the fact that my kitchen is quite narrow and long. It’s not quite a galley way kitchen and Jon and I easily fit in the kitchen together, but it’s also not quite big enough to be the social hub I would have liked. My single favourite thing about my new kitchen goes a long way to solve this little problem. I have a rather quaint, if a little retro, hatch! Cooking for me has always been a great way of connecting and interacting with other people. I absolutely love that I can use the hatch to chat to my friends and family gathered in the lounge or round the dining room table. The hatch also means a lot to me because it reminds me of the hatch in my grandparents old house when I was growing up. Dinner was always shared through the hatch and we all came up to take a dish before sharing it with the table. It may sound a little silly but this single feature really sold the flat to me. With the hatch in mind, I also love my butchers block which placed just below the hatch so I can chop away facing out into the next room. The butchers block is incredibly handy with extra drawers and shelves for storing cupcake stands, Chinese dinner sets and more. I know the “country style” kitchen is perhaps over done a little but I love bringing a bit of rural chic to my little flat in the suburbs. When we eventually move and buy a house of our own I’ll have to find a new butchers block to take with me. The one thing about living in rented accommodation is that you really have to make the most out of the space you’re given. 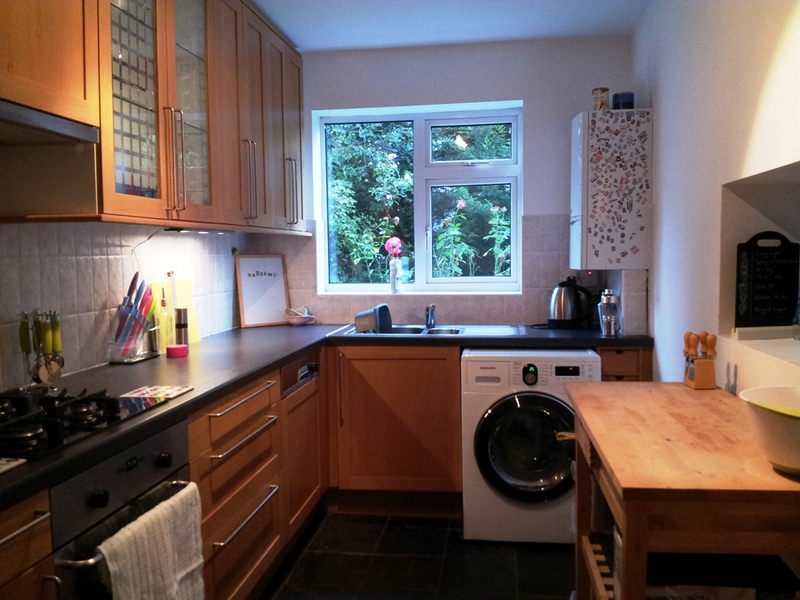 I’m really lucky that although my kitchen is quite narrow it’s also quite long and the cupboards are oddly tall. This means I’ve got plenty of storage but, being just 4’11”, it does present one problem… reaching the contents inside! Luckily for me I have these awesome steps to help. Another way of really stamping your identity on a kitchen you haven’t designed yourself is selectively choosing what to have out on the counters. 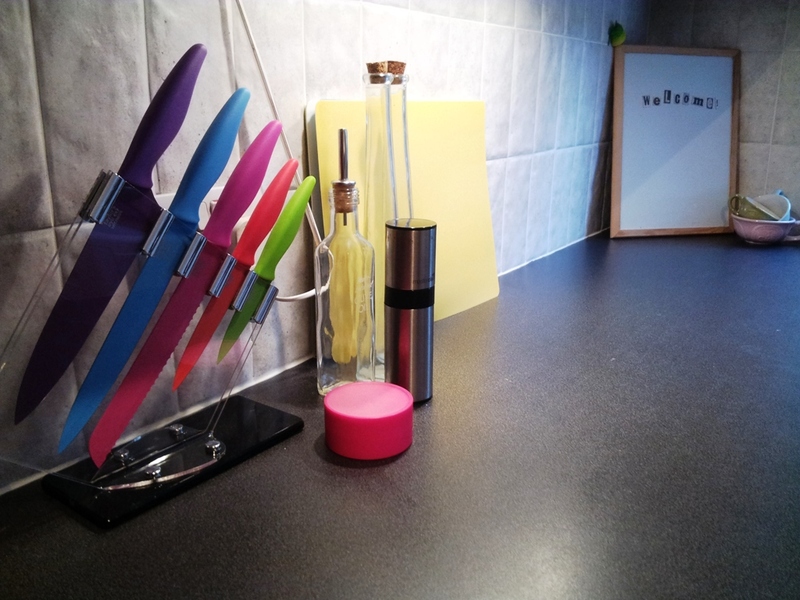 For me a brightly coloured knife block was essential. You can buy these almost everywhere though I made sure I bought knives that weren’t just visually awesome, but could also chop! A good quality set of knives is essential for any food lover. With that in mind it’s probably good that I have a small kitchen as although it sees a lot of action, I can only get it so messy! 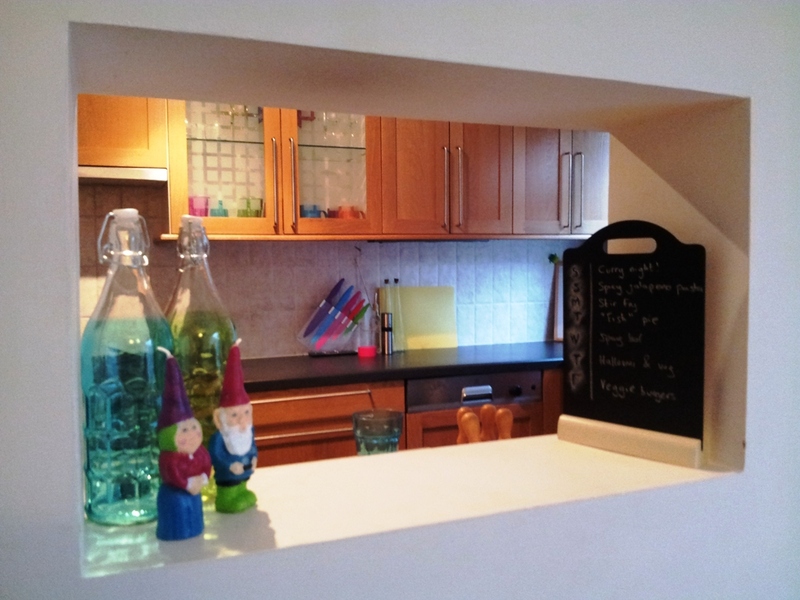 There are some other pretty cool features in my kitchen like the built in dishwasher, and fridge freezer hidden away behind cupboard doors which for me also add to the minimalist clutter free feel which is so important in such a small space. All in all, it may be small but it’s mine and I love it. So that’s it: a grand tour of a kitchen that is finally all mine. (Oh…and Jon’s of course!) Perhaps now when you’re reading my recipes you’ll be able to picture me chopping away at the butcher’s block under the hatch, with my brightly coloured knives, chatting away to friends and family or sneaking a peek at the TV! As promised here the links to more of your favourite food bloggers My Kitchen posts. Read on to find out about their favourite gadgets, their colour scheme, and why they love their kitchens as much as I do. 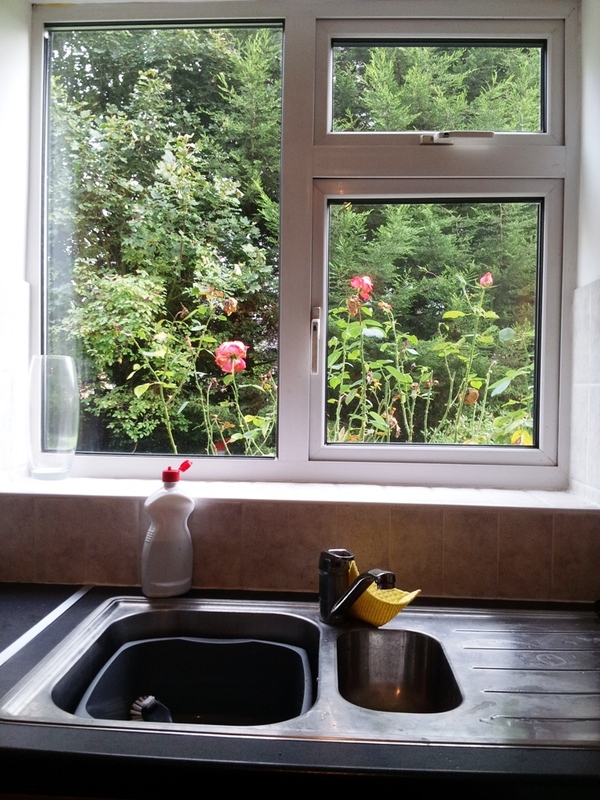 If you’d like to share your post on your own kitchen please do so using the link up below!